Our Circle 7 traveling bee is coming to a close. I received two quilts from Amy last week and quickly got to work on Lindsey's. 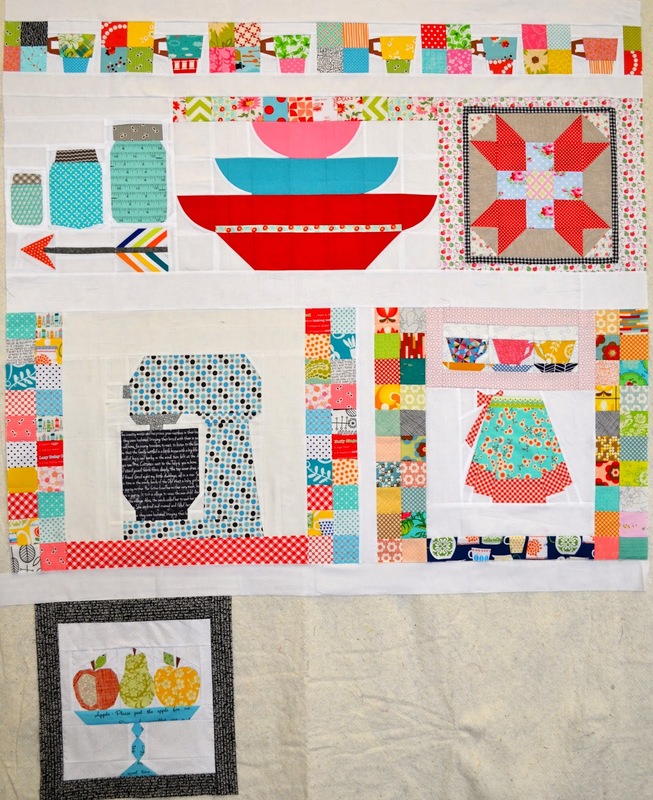 Lindsey chose to do a kitchen theme for her quilt and it is looking amazing! I added that top row of four squares and espresso cups, but other than that, this is how the quilt looked when it arrived in my mailbox. I recently bought the book Playful Little Paper-Pieced Patterns and knew as soon as I read through it that I would be making this for Lindsey's quilt! By the way, this book is amazing. The first portion of the book features a calendar quilt with a pattern for each month of the year (and a bonus project to make for each month's pattern). I think the fruit plate is September. Before I got that book, I purchased the kitchen and pantry pattern sets from Sew Ichigo during a black friday sale. I figured I should put that to use as well and made a row of cups and four patch blocks. The only problem with an organic creation like this is that it can be hard to get things to line up. Do I center my row on the real center? Try to line it up with some other patchwork? I really wasn't sure what to do. I did add a border of white above and below it. I was really trying to help this quilt grow vertically a little! I didn't sew my fruit stand to the quilt before I passed it along, I figured Jennifer could finish that row before it goes home to Lindsey. So now I have Jennifer's quilt to work on and it will be a full circle! I have a busy week of sewing ahead of me, and it seems like everyone does! Are you overcommited for March too? Love that fruit platter block. This quilt will look amazing. This quilt is so adorable! I'd love to do a traveling bee at some point. You get to be so much more creative than just making blocks. Every traveling bee quilt I've seen has just looked awesome! I adore what you added to Lindsey's quilt! That fruit platter is spectacular! And the border of cups-perfect! I'm really enjoying seeing these quilts go around. Your fruit stand is awesome! I just bought that book too, then I won a copy. But that's ok, cause the one I purchased will make a great gift for someone. I think that cup border helps bring the quilt towards a more finished look. Echos the patchwork in the other pieces really well too! My March is purposely under-committed. It's my chance - better enjoy it!